Spreader & Sprayer Testing Ltd (SCS) are a long time customer of ours here at Langley Foxall, and after doing what they do for longer than I've been alive, it's only natural that they are setting the bar high in their field. The administration team would get behind due to levels of data entry and form checking to ensure high quality results. Manual calculations take place for Coefficient of Variation. Manual calculations take place for engineers wages. Manual calculations take place for invoicing. Errors could result in engineer revisits to the customer. Lost paperwork could result in engineer revisits to the customer. Time on site would be an average of 2 hours due to manual / repeat testing of settings meant inconsistent results and wasted resources. Evidence of correct job completion was difficult to ascertain. Almost no possibility of business analytics. We developed an administration panel and a mobile app for the engineers in the field. The Administration Panel allows singular data entry of customers, job creation, storing and access of historical data on customers (all tests, jobs and invoices), job bookings, business and statistical analysis, automatic invoice calculations and engineer pay from jobs, machine specific settings analysis and editing of engineers reports. 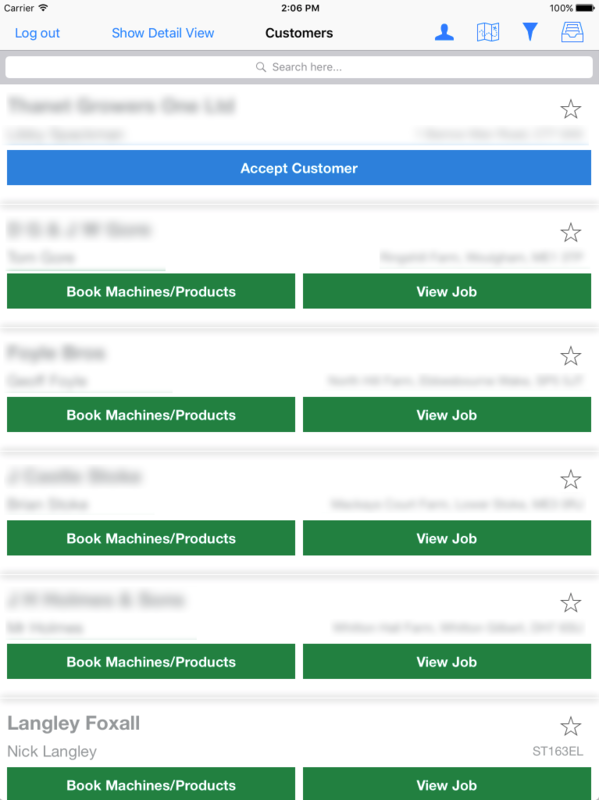 The Mobile App allows form based data entry, where the office sends a job to an engineer electronically, the machine details and customer information are pre-loaded, forms are dynamic and questions change based on the machine being tested. Engineers have access to historical machine tests and settings, they can then find the best settings and apply them rather than using “remembered settings” or wasting valuable resources (time, fuel, fertiliser) doing excessive test runs. The application allows real time data transfer from the office to engineers and visa versa, errors get picked up within minutes and missing or erroneous data can be entered or corrected by engineer's or office staff. The customer calls to book in their machine. They then get entered into CRM. The customer gets assigned to an engineer. The engineer completes a site visit. Whilst on site, they complete their report. Following the completion of the report, they upload it to the system. The office based staff check report. The system automatically calculates the invoice value. The office staff then have the option to send the invoice. Finally, the system calculates engineer pay. Shortening the job flow considerably. Automatic calculations for Coefficient of Variation. Automatic calculations for engineers wages. Fewer errors in calculations/data entry. Big data on previous test results and machine settings means that engineers and Office staff have instant access to the best settings for machine - this is constantly evolving with machine and fertiliser changes over time. Time on site is reduced for engineers. The director is able to do analytics on engineers, machines tested, jobs booked, jobs completed and a plethora of other stats allowing him to better understand how his business is performing. More data being gathered on reports = richer / more informative results. Our relationship with SCS will undoubtedly continue over the years as our companies work together to further use software to streamline SCS’s business practises. 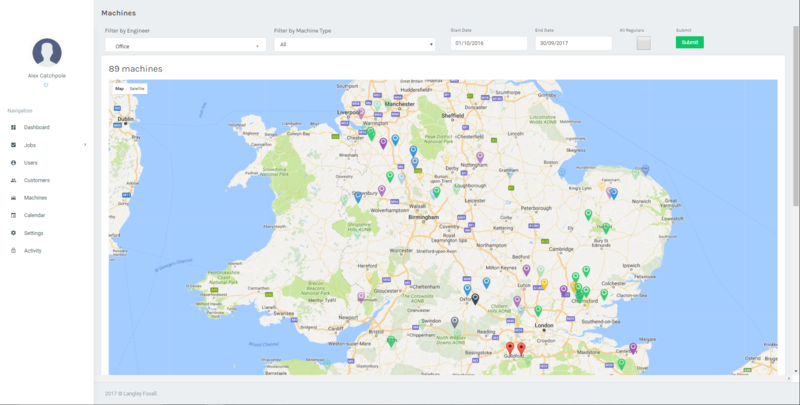 Click here for another example of the way Langley Foxall Ltd has worked with clients JHPS Gardens, to eliminate the use of spreadsheets and numerous smaller systems into an all-encompassing service management system.